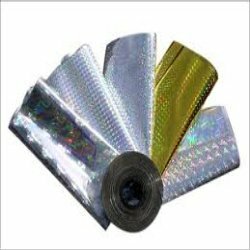 In strict adherence to latest trends of the market, we are engaged in manufacturing, supplying, distributing, wholesaling and also exporting a broad array of Hologram Films And Foils that is of excellent quality. Range that we are offer to the dearest clients are highly reliable and ideal to be used for long time. Moreover, made available to the clients as per their detailed specifications, we have been able to largely satisfy their needs by offering them this offered range at the market leading prices. 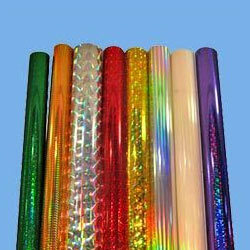 We are committed to deliver a flawless range of Holographic Custom Design Films to our valued clients. In order to stand tall on their expectations, our team working with utmost sincerity while also maintaining close and very intimate association with each other. Furthermore, our products comply with the current market trends. 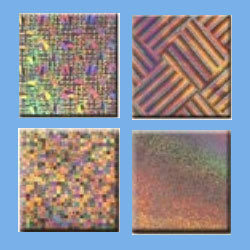 Customized range of Holographic Stamping Foils are popular among the clients hugely as it is manufactured under stringent guidance of our expert team. Followed by this, our team of quality controllers evaluate this range thoroughly applying some test to ensure its quality. Moreover, competitive price of products has also facilitated us to satisfy the needs of our clients. We have an excellent manufacturing unit in General Pattern Rolls, which is fitted with comprehensive machines. Our technology, requisite facility and diligent professionals have enabled us to design our range as per the latest market trends.